How to use technology to scaffold student learning? made me realize that there are two types of scaffolding: 1) to successfully learn a concept and 2) to climb up levels to more complex learning about a concept. We can have students go to website in which they practice a certain math formula through breaking the formula into its subparts. The website scaffolds the process so that they can correctly use the math formula. The students have succeeded in learning the formula. We can have students go to another website where they have to figure out which math formula to use and apply it to real life situations. If students want help (scaffolded learning), they can go to a section which asks them questions about each formula and its use. The students have succeeded in learning information at a higher level through the scaffolding. Another image is between a web scavenger hunt for facts and a higher level thinking webquest in which students compare and contrast information. How do we use technology to scaffold student learning? To learn the lower level of a concept or to explore the higher more complex level of the concept? So where do you place your videconference in your learning unit? Why is that an effective location? How does your assessment reflect that learning purpose? Grant Wiggins stresses that teachers spend too much teaching and covering content and not enough time in assessing. and have a shared vocabulary. How often is everyone assessed? What type feedback is each person given? If the answer is often and formative, then student learning is the focus. 1) Videoconference learning does not need to be assessed since it is simply one activity in a bigger unit. My response: How can you proceed in the students’ learning if you do not know what they have or have not learned? Madeline Hunter was famous for her “monitor and adjust” as critical part of the learning process before students could move on in their learning. Frequent embedded assessment is a major issue in education now. 2) The students’ discussion during the videoconference shows that they understand the topic. My response: How did you assess the students’ individual comments and questions during the discussion? Did everyone participate? At what higher level of thinking? Or did you get “a general feeling” about the understanding of the topic from those students that volunteered? 3) When students enjoy something such as the videoconference, they learn better. My response: I do not disagree that students enjoy videoconferencing. I want to see tangible learning results rather than just smiles. I have no problem with affective learning is that is the stated primary purpose of videoconferencing. How will you measure their emotional responses? 4) They learned so much about other students’ culture through the videoconference. My response: Wonderful. Was that a major goal of the project or did it just happen? If it was a major goal, than how did you structure the videoconference to increase global awareness? What cultural attitudinal changes did you want to happen? 5) They learned so much factual information. My response: Couldn’t they have learned the same amount through a good encyclopedia entry or an educational “movie”? I would hope that when we bring experts into the classroom, they can help our students to use higher level thinking skills in that topic. Do educators see videoconferencing as candy or carrots? Only a few of the articles and websites even mention the carrots of learning. Occasionally, there are questions like “Did this videoconference meet your educational goals?” There are many general statements like “My student learned so much!” The detail or proof is very sketchy. “We predicted what would happen.” Did someone check each student’s prediction or did some students volunteer? Was a whole group assessment done? 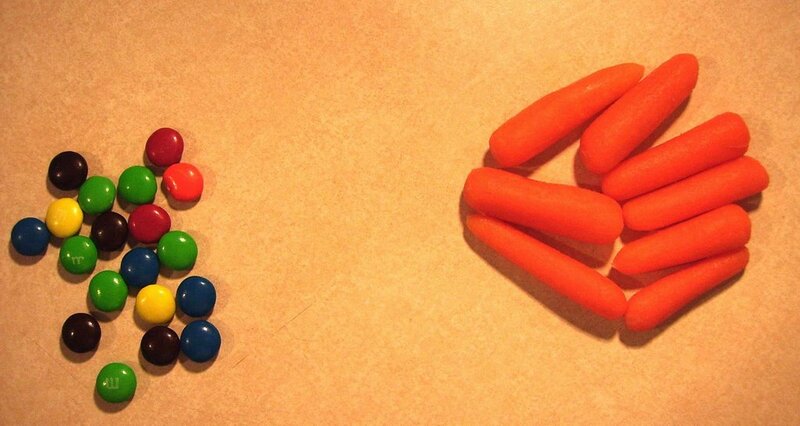 Do educators in your educational institution use videoconferencing as candy or carrots? How can you decide? Assessment is the key. Do your educators assess the learning from the videoconference immediately or the next few days? Do your educators have students do follow up performance tasks based on the videoconferencing? Do they assess those tasks?